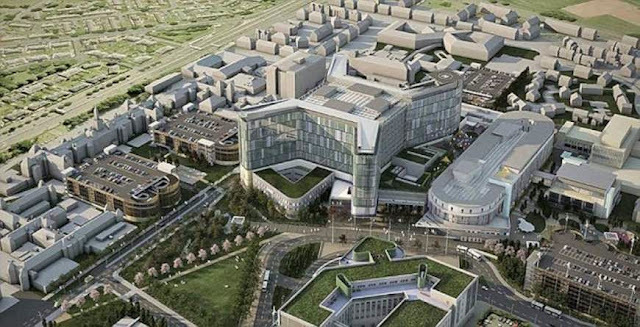 The South Glasgow University Hospital is one of the biggest critical care complexes in Europe. It is nicknamed the "Death Star" by locals because of its imposing 14-storey star-shaped design, topped by a landing pad for aircraft. The hospital cost £842m but the medical equipment inside has brought the final total closer to £1bn. The project was funded by the Scottish government. The new campus is built on the site of the old Southern General in Govan in the south west of the city. It will house a new 1,109-bed adult hospital and a 256-bed children's hospital. Every patient in the general wards in the 14-floor hospital will have their own single room with an en-suite and views out across the campus. Demolition of the old Southern General surgical block will begin in the summer and be completed by the middle of 2016. It is stated that patients from the old Victoria Infirmary and the nearby Mansionhouse Unit will begin the move to the new hospital in May. The good point is that leaflets are proposed to be delivered to every household affected, outlining the changes to A&E provision. The hospital features interactive displays for children developed in collaboration with the Glasgow Science Centre, along with a cinema and roof garden in the children's wing. Patients enter the main hospital through a dramatic atrium which stretches up the entire height of the building. There are self-service check-in machines, and nearly all of the 1,100 beds have their own room, with an en-suite bathroom and views out over the city. A fleet of robots deliver linen and other goods via a network of underground tunnels. The new hospital has not been without its problems. Staff say there are not enough car parking spaces and there have been claims that there are not enough beds, despite its huge size. More interesting is this report in MailOnline which states that - “visitors to £1billion Glasgow super-hospital get stuck in the lifts... because they have no buttons inside”- sounds strange for a state-of- the-art building that cinema, robots and ....button-less lifts !!!! Visitors to a £1billion new super-hospital keep getting trapped in the lifts - because they have no buttons inside. The futuristic new 14-storey South Glasgow University Hospital opened to patients last month featuring robots, a children's cinema and lifts without buttons to try and bring 'healthcare into the 21st century.' But it appears the ultra-modern facility appears to be ultra-confusing for many staff and patients who claim they have spent 'what seems like days' trapped in the speeding elevators. One hospital worker said: 'It's an amazing building but I've spent the majority of my time in the lift so far - as have a lot of people. Finding one’s way up appears confusing. 'I had to go just one floor up, not long after arriving. I jumped into the lift without pressing the button and was lost for nearly half an hour! 'The staff will get used to it, but it catches newcomers to the building out time and time again.' The issue arises from the fact that the new modern new lifts which will only travel to pre-selected floors. Anyone jumping in without pressing a floor number first may be stuck for quite some time. It has become such an issue that NHS bosses have now enlisted staff and volunteers to explain how to use them properly. There are even animated films to help people figure out how to negotiate the new building. Nicknamed the 'Death Star' by locals because of its giant 14-storey star-shaped design, the £1 billion hospital was funded by the Scottish Government. The lifts are just one aspect of a futuristic design that also sees the hospital boast self-service check-in machines, a children's cinema and a fleet of robots delivering linen and other goods via a network of tunnels. A spokeswoman for NHS Greater Glasgow and Clyde defended the new lifts, but acknowledged it may take time for people to get used to them. She said: 'These lifts have been chosen because they offer the best way to get our patients to their chosen floor as quickly as possible. Scottish First Minister Nicola Sturgeon claimed the state-of-the-art South Glasgow University Hospital –featuring a fleet of robots delivering linen, a children's cinema and helicopter landing pad – proved the SNP's commitment to the NHS when it opened last month. It also comes amid growing pressure on English hospitals' finances, amid warnings of a financial 'black hole'. It sounds amazing concept and technology to have buttonless lifts ! !